The Texas Centennial Half Dollar was struck in commemoration of the 100th anniversary of Texas declaring its independence from Mexico on March 2, 1836 during the Battle of the Alamo. Recognizing the significance of this anniversary, on June 15th, 1933, Congress approved the first commemorative coin legislation since 1928. 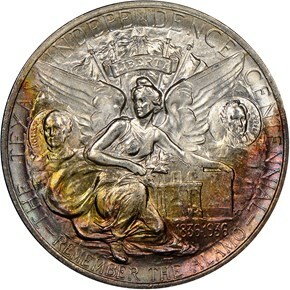 It provided for the mintage of up to 1,500,000 souvenir half dollars to be sold as part of the centennial celebration. Proceeds from the coin were to be used to help construct a memorial building. 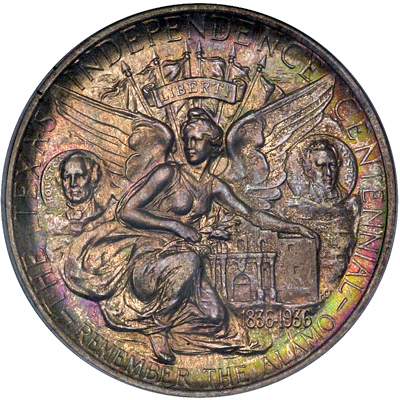 Sculptor Pompeo Coppini was selected to design the coin. In May of 1934, his models were approved by the American Legion Texas Centennial Committee. Although all of the many elements on the finished coin were already in place, they were rendered in an extremely crude fashion. The Commission of Fine Arts requested many changes, to which Coppini agreed. The final designs were approved a month later, on June 25th, 1934. 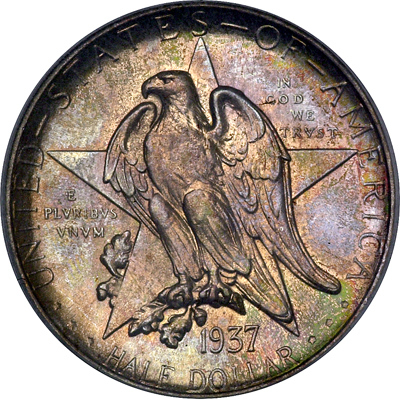 On the obverse, an Eagle is seen perched on a branch in front of a five-pointed star, the symbol of Texas. UNITED - STATES - OF – AMERICA is placed around the periphery of the coin, with HALF DOLLAR bellow, as well as the mottos IN GOD WE TRUST, and E PLURIBUS UNUM. While that may sound like a busy design, it has nothing on the reverse, which was one of the most complicated and intricate designs of the entire commemorative series. The main feature of the reverse is a kneeling goddess Victory with an olive branch in her right hand, and her left resting on the Alamo. Above is the word LIBERTY on a scroll, behind which are six flags. Beneath Victory’s wingtips are portraits of Texas war heroes Sam Houston and Stephen Austin. THE TEXAS INDEPENCED CENTENNIAL and REMEMBER THE ALAMO encircle the design. The reverse contains nearly no field whatsoever, as almost every area is taken up by a design element. 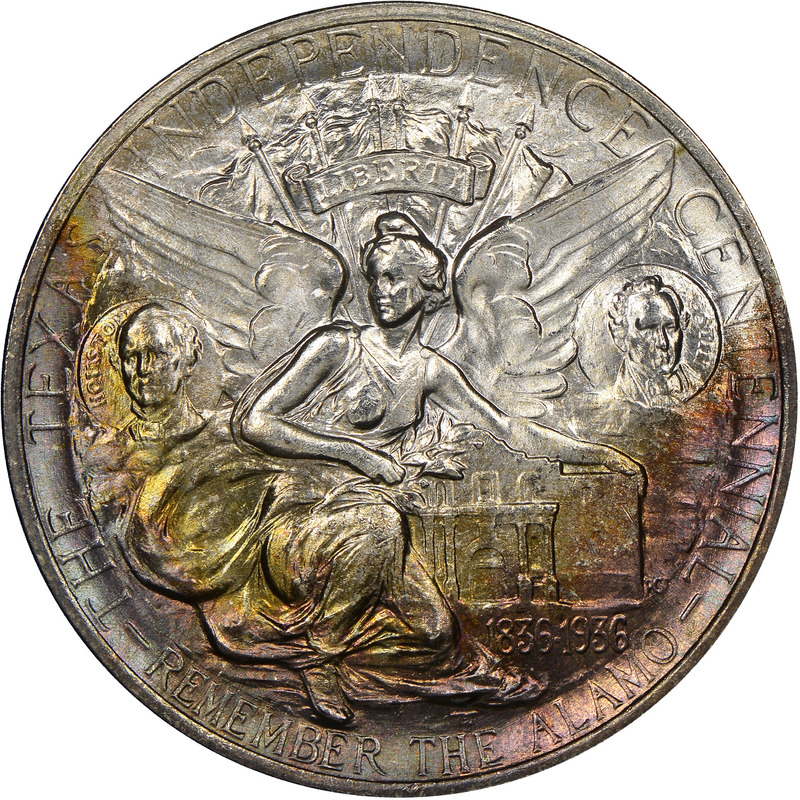 Mintage of the 1934 issue started off strong, with 205,000 pieces. However, sales lagged and a large portion of these were eventually returned and melted, leaving a net of 61,463 for the year, all from the Philadelphia Mint. The numbers dropped off significantly in 1935, with only around 10,000 coins being minted at each of the 3 mints. 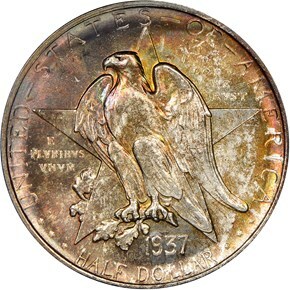 The numbers dropped again by about 10% in 1936, and by 25% in 1937 as collectors grew tired of having to buy more and more coins with the same design but differing dates and mint marks. 1938 was the last year for the Texas Centennial Half, with only about 3800 sets sold. 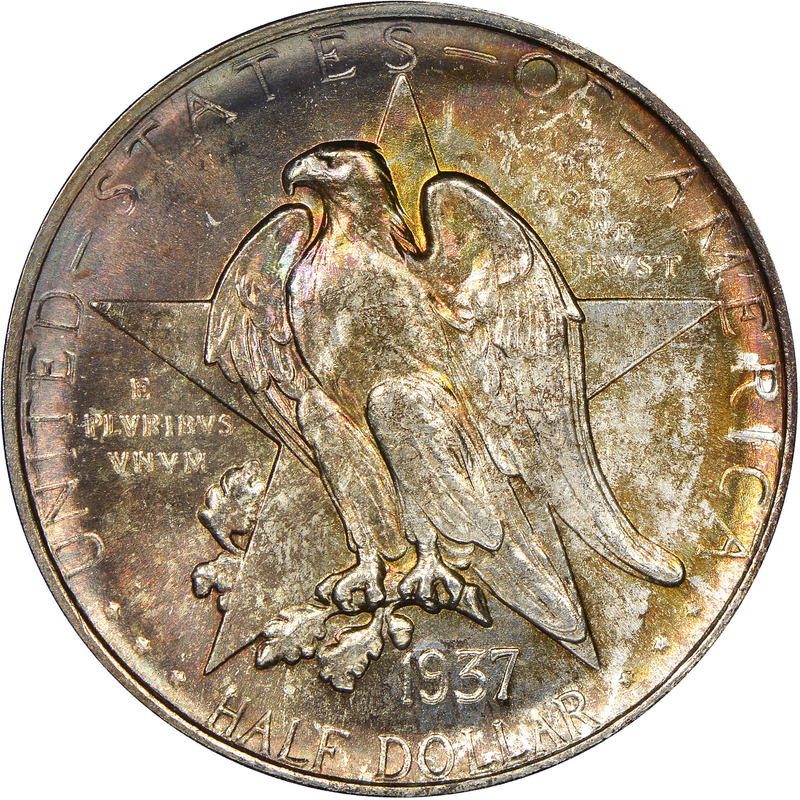 Due to the ever lowering mintages as the Texas Centennial Half program progressed, a safe rule of thumb is that the later the issue year, the more valuable the coin. In fact, the 1938 issues are often worth nearly double those of the much more common 1934! Though its exploitation of the commemorative coin privilege was deplored by collectors, to its credit this committee did ultimately erect the promised memorial museum at the University of Texas in Austin. 1/18/2010 — A recent example from our conservation laboratory.